One of the most fulfilling parts of the work of the Enhancement team is working on the Teaching Awards for each year, especially the Student Led Teaching Awards. We have recently completed the process for 2016-17, having presented the awards to staff at the Annual Teaching and Learning Conference 2017. So what are the Student-Led Teaching Awards? The awards are a way for students to recognise the valuable contribution of staff to their teaching and learning experience. You can read the full description of the awards and categories on our blog post on last year’s awards, or on the ADQE webpages. 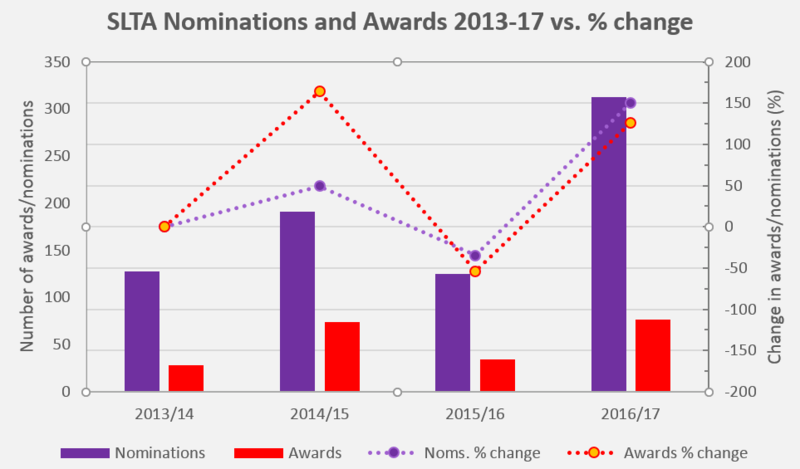 There were no major changes to the Student-Led Teaching Awards this year, however we began asking students to provide their study level (undergraduate or postgraduate) and to suggest a category of award to give to their nominee. This helps the decision panels making the awards to agree the category of award. We have also emphasised the importance of detailed supporting comments, which worked well and most of this years’ supporting comments were detailed and clear. Any student was able to complete the nomination form as many times as they liked, which asked for some details about themselves and the staff they wish to nominate. They were asked to tell us the staff they felt deserved an award, the category of award they would recommend, and to give some supporting comments for their nomination. ADQE pulls together and checks all of the nominations received from students, as well as supporting the decision panels. These decision panels are groups of Students’ Union Officers and Student Representatives who decide which staff should receive awards based on the supporting comments. All nominations are considered by Student Reps from the same cluster (namely Arts and Humanities; Social Sciences; Sciences) so they are considering staff with whom they may have some interaction. Once the decision panels have agreed which staff should be given an award, ADQE contacts the winners and provides anonymised nomination text in the announcement. We then get ready to present the certificates at our Annual Teaching and Learning Conference – more on that below. What were the numbers for this year? This year we had a huge increase in the number of nominations, around double last year’s nominations. As a result of the excellent supporting comments received from students, the decision panels made more than double the number of awards! 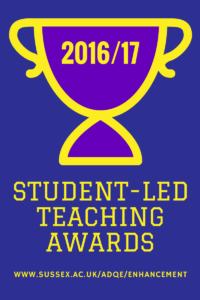 Who won Student-Led Teaching Awards this year? As mentioned above, we had a bumper 77 awards given this year across the five categories of award. The complete list of winners of Teaching Awards from previous years can be viewed on the ADQE webpages. He is pioneering intersectionality within the department and the university itself. He takes student voices really seriously and has given students the opportunity to have an impact on the curriculum. She is passionate about her area which makes her lectures and tutorials interesting and fun. She is kind and extremely supportive. She has time for any student no matter what her work load is. Her communication with students is outstanding considering she is a course leader, lecturer, researcher and supervisor to many students and she always has time see an individual whatever the issue may be. She is approachable and friendly and I really feel she deserves this for her lovely personality and all of her hard work for the faculty. He manages to make us think critically constantly and his teaching has seeped into my every-day life. It is really encouraging to see someone like him as a teacher at Sussex. He is open to listening everyone’s ideas and never makes you feel like you said something completely out of place, instead he works through it with you allowing you to understand complex concepts. He is very open to constructive criticism, both from him to us and us to him. Her explanations of complicated material were always clear, logical and thoughtful. But there was an unfailing enthusiasm that made what started as our least become our most enjoyed module. Every single lecture was engaging and she went beyond the content of the course to impart why statistics is important and relevant and interesting. The best teaching techniques I have experienced at Sussex University. Well organized classes, planned way ahead of time. Study direct ready the minute we finish our class. Class time management incredibly well distributed. Makes all students feel confident and comfortable… Made my experience at Sussex good enough that I am thinking to apply for a PhD here. He has been encouraging to every student in the department I know from day one, always offering support and a listening ear if we need one. He has always been fantastic at helping us with technical problems, as well as offering advise on getting through the course. I cannot imagine these three years without his support. The winners were invited to collect their certificates at the Annual Teaching and Learning Conference, held on the 5th April 2017. The presentation ceremony was well-attended and the certificates were presented by the Pro-Vice-Chancellor for Teaching and Learning, Prof Clare Mackie. Finally, let me just add our warmest congratulations to all winners of Teaching Awards this year – your hard work is much appreciated by staff and students! ‹ What is a learning outcome? And why do we use them?